First party racing title from the developers of "MSR". This title looks to bring some fierce competition to Sony's Gran Turismo franchise. Featuring real-life cars, Gotham has the added bonus of having cars you can damage (something that the car manufactures usually do not allow). 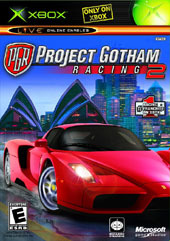 "Project Gotham Racing 2" is the newest version of the critically acclaimed "Project Gotham Racing" franchise. Rewarding drivers for focusing on speed and style while still taking risks around every corner, "Project Gotham Racing 2" offers circuit-ba.. The sequel to the very-spooky Silent Hill takes part in the same freaky town as the original. While the Xbox version will contain unique content, Konami has yet to speak publicly about what those addi..